DIRECTIONS: Put about 3 - 4 pounds of chicken parts into a resealable plastic bag. I like dark meat, but Susie likes white - so - I divide it into two bags to keep it straight. Then, add enough mixture in each to cover all the chicken parts, and let it marinate in the fridge overnight. Oh wait!! I forgot. Hold a little of the mixture back to use as a baste when grilling. Flip the bag occasionally to ensure coverage. LET'S DO IT: I use a Weber kettle grill because I like the old-fashioned charcoal barbeque flavor (and sipping on Jack Daniels while I wait). Use direct heat. Turn the chicken every minute or two (basting as you go). After all, the words "Huli Huli" mean "Turn Turn" in Hawaiian. 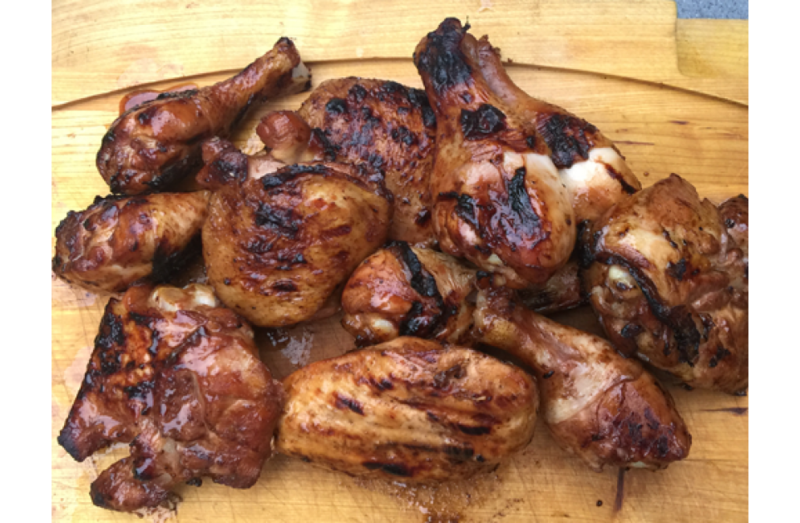 Be sure your chicken gets to 185°f, pile it on a serving platter, and enjoy. Absolutely the best.